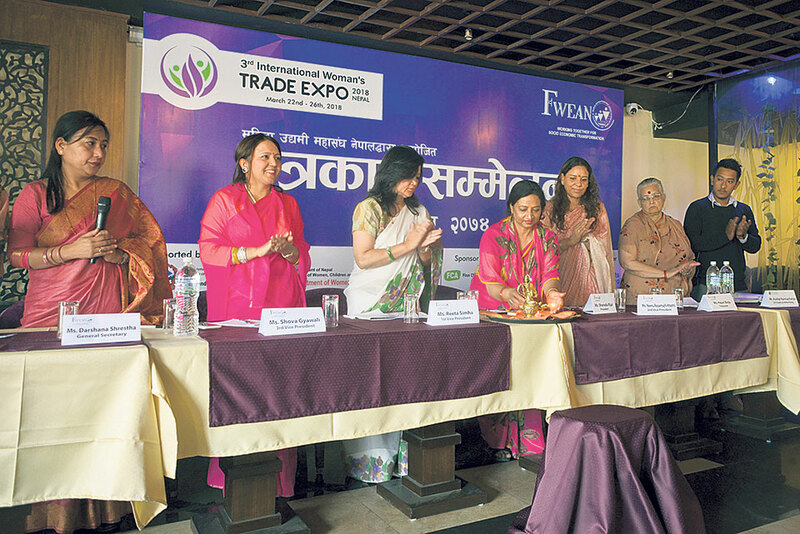 KATHMANDU, March 13: The Federation of Woman Entrepreneurs’ Association of Nepal (FWEAN) is organizing 3rd International Women’s Trade Expo in Lalitpur from March 22 to 26. Organizing a press meet on Monday, the federation said that the expo will be held at Heritage Garden, Sanepa. The expo is being organized in association with Trade and Export Promotion Center, Department of Women and Children under the Ministry of Women, Children and Social Welfare, and International Labor Organization with the objective of developing internal market for handicraft and agro produces as well as to promoting their export. According to the federation, women entrepreneurs from Nepal as well as Bangladesh, India, Thailand and Pakistan, among others, will participate in the expo. There will be around 100 stalls in eight different pavilions. There will be separate pavilions for agricultural produces, international exhibitors, trade stalls, and handicraft products. Likewise, women entrepreneurs affiliated to 30 different chapters of the federation will showcase their products in a separate pavilion. Similarly, will be a separate stall to showcase goods prepared by differently-able people. Decorative products, handicraft products, herbs and agro produces, furniture, several food items, ornaments, wooden crafts, paper products and other handmade apparels, among others will be showcased at the expo, according to the organizers. She further added that the federation was working as a bridge between women entrepreneurs across the country and the government. The FWEAN is also organizing B2B meetings between Nepali and foreign women entrepreneurs. The event is expected to receive over 50,000 visitors. Likewise, they are expecting buyers from countries like Germany, China, India and Bangladesh, among others. Transactions worth Rs 50 million are expected to be recorded during the five-day expo.